In what he calls one of the high points in his life, Andy Fort got arrested on charges of disturbing the peace in 1972 in front of Westover Air Force Base in Chicopee, Mass., when he joined the 400 people protesting the Vietnam War. 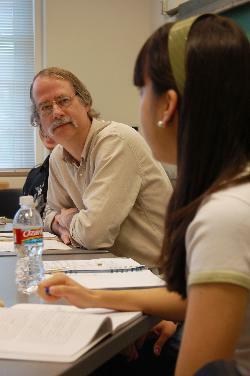 << Andy Fort, an East Asian religion professor, listens as junior broadcast journalism major Alyssa Dizon talks about the Schieffer Symposium in his 9:30 a.m. Buddhism class. Fort has been encouraging "mental migration," or seeing an alternate worldview, in his students for 26 years. The base was a strategic location for protest because it was where the military trained and sent bombers to Vietnam. The base had deployed B-52 bombers and tankers to Southeast Asia two weeks prior to the protest. As one of the 95 people arrested on charges of disturbing the peace, disorderly conduct and blocking the public's way, Fort said, he didn't plead innocence because he "went to be guilty." Instead, he pleaded no contest and paid about a $50 fine. He says because the protests were costing the city a lot of money, he felt he had to pay it back. The protest was mostly a symbol - a symbol that thousands of people considered the war immoral. And though their interfering with the road to the base two hours a day didn't stop the "Nixonian war machine," Fort said the protesters made a dent that they couldn't have without showing up to express their opposition. "Practically speaking, we interfered with people being able to get on the base to fuel and prepare bombers," he said. More than three decades later, Fort opposes the war in Iraq with a similar passion that fueled his protests in the '70s. His voice crescendos and speeds up and he can barely keep himself from spouting expletives as he curses the Bush administration for its policies in the Middle East. "It's just so many people died - it's like Vietnam in that sense - who didn't need to die," he said. "They died because of ignorance of our political leaders." But this passionate opposition to the war doesn't take him out to the streets protesting the way it did when he was a student. "It's not the temper of these times," he said. Fort has become less politicized over the years, and he suspects it has come with age. His activist attitude doesn't manifest itself physically or tangibly, but the passion for change remains blazing. He received the lowest student evaluation ratings in years fall 2004, and he speculates his depression over the presidential election had something to do with it. "I never thought that Kerry was going to be able to beat Bush, and the notion that this country, which I love so much, would not only elect that idiot but would also re-elect him and just continue that disaster in Iraq, shafting the poor people and building up this unbelievable debt - it was something that was so depressing to me," he said. "I think it showed up in my everyday behavior." He says although he isn't protesting and getting arrested, he holds the same opinions and values. He now manifests them by donating and voting in correlation with his views. His influence on campus has also taken on a different role over the years. Besides helping pioneer Hunger Week, Fort petitioned the Board of Trustees to divest from corporations that invested in South African countries during the apartheid and the same year Fort was granted tenure. As chairman of Faculty Senate, he stayed active helping start the plus/minus grading system, and the following year, as chairman of the University Compensation Advisory Committee, he worked to ensure the lower-ranking staff received sufficient health care coverage. Fort, an East Asian religion professor, had been an activist against the Vietnam War before he began studying religion, but he explains his involvement in social justice issues through Buddhist philosophy. According to the Buddhist worldview, everyone is interrelated. People's attachment on the concept of self separates them from one another. He explains that when one says, "I am," people often find importance in the subject - the word "I" - the self. But Buddhist teachings say the significance in the phrase is not the subject, but the verb, "am." The verb illustrates the belief that humans are interrelated in the fact that they are all human beings. "To be is to be related," he says, "and you and the world aren't truly divisible. "You can't really be OK if the world around you isn't. You see that you can't be liberated or even fully happy while others are suffering." Although it is easy for many to lock Fort up in a box labeled "Buddhist," Fort says Buddhism came to him, not the other way around. During his academic exploration of world religions, Fort found aspects of Buddhism "simply rang true." "It's not like I believe it or I have faith in it," he said. "This is just how it looks to me. It couldn't be more obvious to me." Although Fort is no longer causing a ruckus in the streets protesting the war, getting tear-gassed and arrested, he continues to challenge the status quo, but this time in the minds of his students. In a classroom on the second floor of Beasley Hall, Fort sits among his students in a circle. With his long, skinny arms folded and resting on the desk, he beams from behind his glasses as he looks around the room. Some make eye contact, expectantly waiting for his first words. Some shift in their chairs and dart their eyes toward their peers, smiling and shrugging at one another. Finally, Fort breaks the silence. The silences at 9:30 a.m. in Beasley's room 205 are not sounds of boredom, daydreaming or sleep. Silence, in a Fort classroom, is the grunts and moans of the students' minds wrestling with novel concepts and questions. Silence, in a Fort classroom, is the sound of furrowing brows, widening eyes and nodding heads. Silence, in a Fort classroom, is the sound of what he calls "mental migration," or understanding an alternate worldview. It is in this atmosphere that Fort has been inviting his students to his academic "home" for the last 26 years. But this doesn't mean that students find themselves subscribing to whatever religion Fort teaches as their own beliefs. Fort simply cracks open their minds and shines light on questions they have never thought about before. Bryce Harp, a 2004 alumnus with an economics degree, said one of the memories that stands out to him is when, during the first class of his world religion class freshman year, Fort "shook up everyone's religious foundations and upbringings" by presenting the history and facts about the Bible. Harp, who was raised as a conservative, fundamentalist Christian, said he had begun to question his beliefs and the reasons behind them by the time he reached college. He said Fort showed him he had a factually logical reason to question the values he grew up to believe in. "Shaking your foundation is a good way to improve your intellect," Harp said. But Harp says his favorite moments with Fort have been in their conversations during office hours, and it is during these hours that Fort causes ripples in his students' lives, beyond their intellect. For Harp, the change occurred about a year ago, when he found himself dissatisfied with where his life was going. He frequently drank at bars and clubs, and at one point, he says, wanted to switch lanes and choose sobriety. So he began meditating, something Fort has been practicing since he was 20, which he says helped him get his life back on track. "I always thought of Dr. Fort getting into transcendental meditation as a way to keep my head on my shoulders," he said. "He said the desire for altering substances goes away." Harp recently quit teaching music and playing guitar for a band. He now works as a legal assistant at a law firm and is preparing to go to law school. "Dr. Fort influenced a lot of people in ways that he doesn't know about," he said. For a 2003 alumnus Wesley Longhofer, Fort's concept of mental migration manifests itself physically. He is in the middle of researching globalization in India, where Fort also spent years researching. Besides his academic career, Longhofer often remembers Fort's Buddhist teaching about detachment from the concept of self when he hits low points in life. "He has his Birkenstocks on, and his hair is too long, and he says, 'Just detach,'" Longhofer said. "That's when I know I'm taking life too seriously." But times have shifted. He no longer wears the Birkenstocks or has long hair, and the changes he is most actively involved in are not as controversial or conspicuous. "I had some students who wanted to go into the Peace Corps or wanted to go into teaching or did things they wouldn't have thought of without meeting me - that's been hugely satisfying," he says. The changes Fort catalyzes in his students are what keep him going. He says he is most religious about being a liberal arts professor, because it's what he is most deeply committed to. "Doing this may be the best thing in the world," he says. "To be able to get to do the thing that you think you're best at. I like having people understand alternative worldviews so they can be touched and they can't be narrow-minded."